In an electronic conversation this afternoon, my sister got me thinking. I think I have found one interesting way to get to know a place in the city. Take a look. 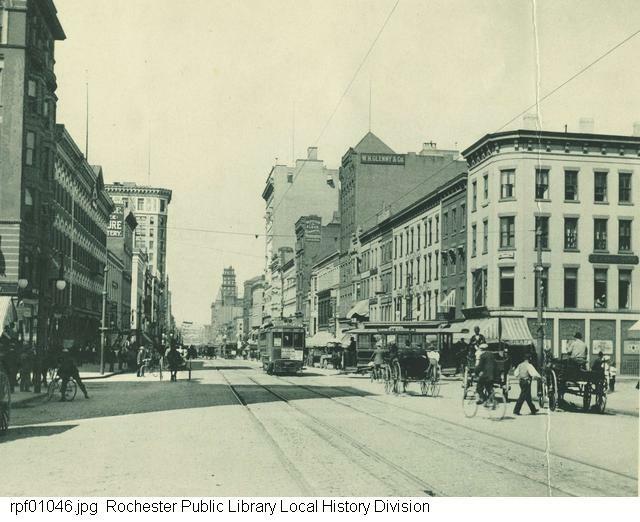 The intersection of Main and Clinton Streets in downtown Rochester, in 1896. Now let’s see what happens over the next century or so. Photo by fusionstigma, from flickr. 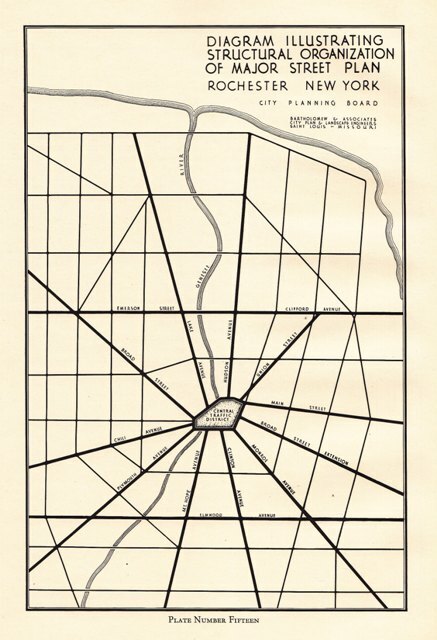 In response to my recent post about 20th century urbanism here in Rochester, fellow Rochester urbanist Tim Raymond suggested that I find a report from the 20s authored by planner Harland Bartholomew. With the help of the Rochester Regional Community Design Center (RRCDC), I found it, and have it in hand. 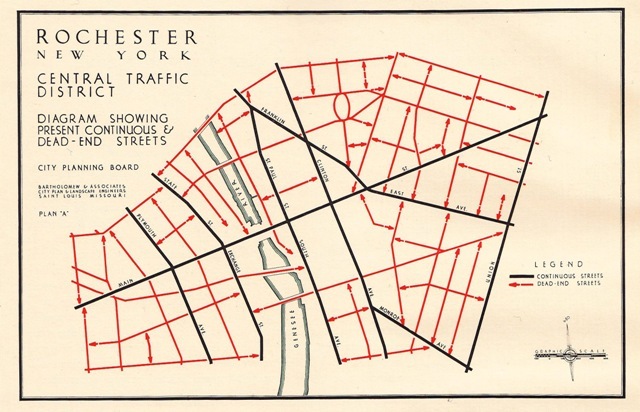 Entitled “A Major Street Plan for Rochester, New York,” and created by Bartholomew & Associates, (they call themselves City Plan and Landscape Engineers), it was published in 1929. 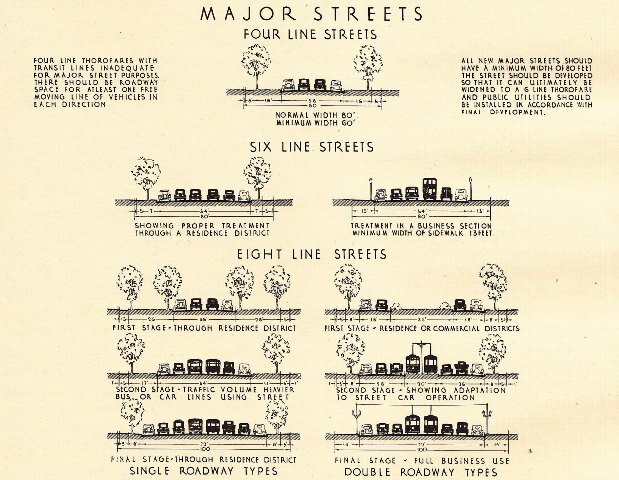 The “Street Plan” is the bad seed of 20th century urbanism here. From this document we can easily get a glimpse of the first nasty tendrils of what was to become the poisonous Inner Loop. Not originally planned to be a moat, certainly – that madness comes later. But in this document, the automobile gains right-of-way over reasonable civic and urban principles, and the future course of regional sprawl is assured. Love the graphics, but…. 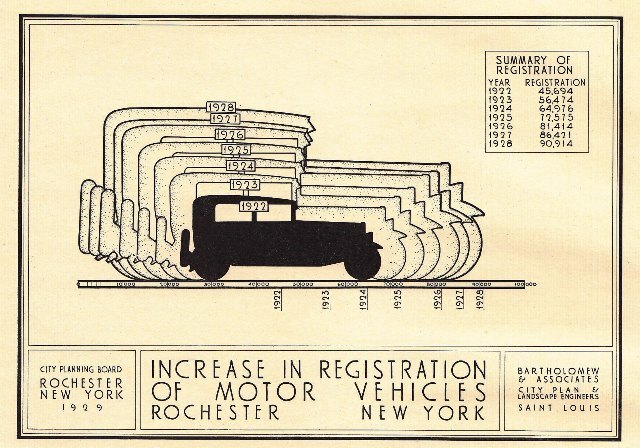 In the 6 years between 1922 and 1928, vehicle registrations in the city had doubled, to about 91,000 cars. And of course with more cars comes more traffic, and more congestion. 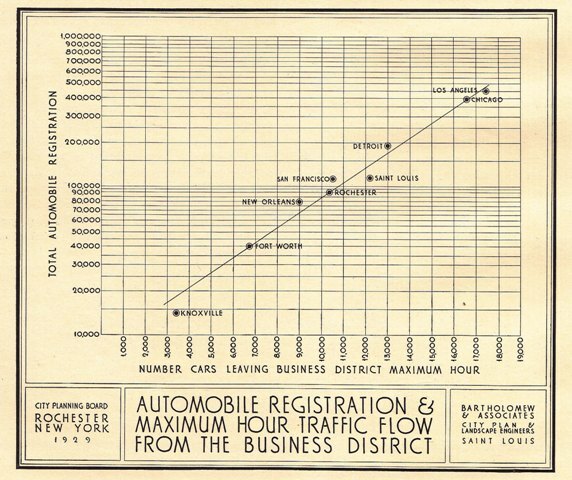 In 1929, professionals were beginning to understand how to analyze and engineer for the ‘motor age.’ Traffic counts, average daily trips per roadway, turning radius requirements, lane widths – all of this was becoming an identifiable discipline. 10,500 cars in the peak hour, probably evening rush since the chart says “leaving business district.” Congestion, traffic, horrors! Of course if we had 10,500 cars leaving downtown at rush hour today, we would think the place had been abandoned. But in the 20s, the roads that the motor age was heir to were not designed for speed, convenience or volume. Most of the city streets were designed for horses and carts, and some redesigned for streetcars. But not motor cars. 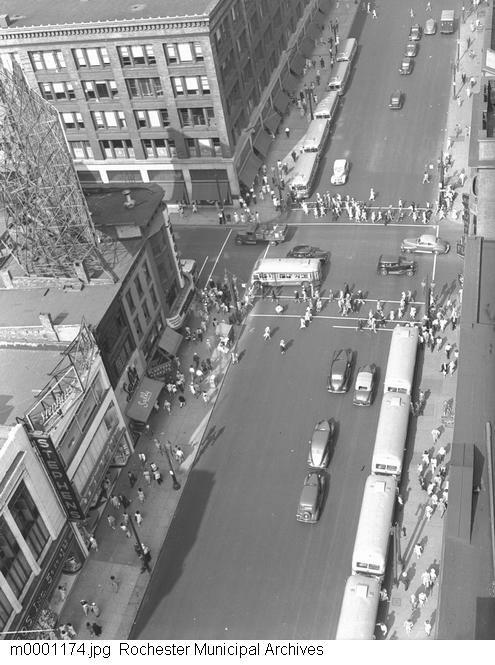 And once the basic rules were established for street widths – we call them cartways today – the routing and connecting and constructing could begin. And so here we go, down the path that resulted 20 years later in the Inner Loop as we now know it. Now the strategy becomes clear. Create a loop of streets around downtown, and through streets within downtown, that are straight, continuous, wide enough for higher volume, and speedy. We’re gettin’ out of town…. And of course we need to see the downtown loop in the context of the roadways of the region. This next image is scary, startling. The city is doomed. So there it is – the Inner Loop at the core, and the beginnings of the outer loops of the other expressways. The stage is set for the predicted city population of 1,000,000 “within the next 50 years” – they got that right – to spread out all over the place with the new network of roads for cars. Bartholomew was aware, in some tiny way, of the dangers that lay ahead. In the report he says, “The automobile has invited an excessive spread of population and it is important that the consequent development beyond the present municipal boundaries be carefully controlled to prevent chaotic and uneconomic tendencies.” Which, of course, it wasn’t. As I said, doomed. By 1929, this city’s fate was sealed. Now what? Onward. 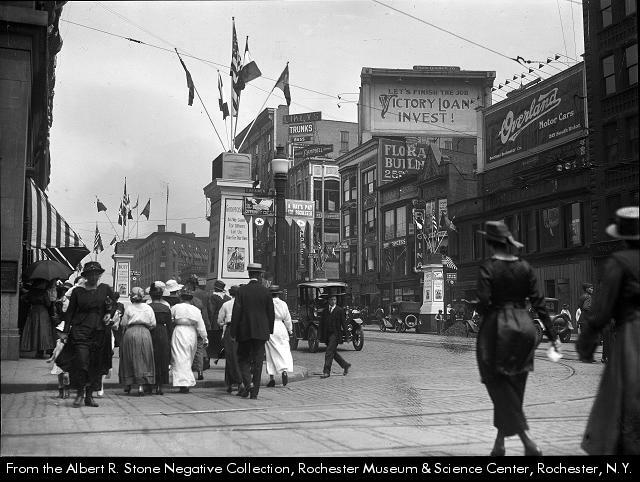 It’s impossible to begin to imagine a next Rochester, or any next city, without understanding its history. In particular, it is imperative to understand how this city got as screwed up as it is during the course of the 20th century. And I do mean screwed up. Oh, Rochester wasn’t alone – the arc of change for this city has been much like the arc of change for most American cities. But the unique efflorescence of modern urbanism here has resulted from the particular identity and character of this place – climate, geography, history, culture, industry, attitudes, events, governance. Let me explain. 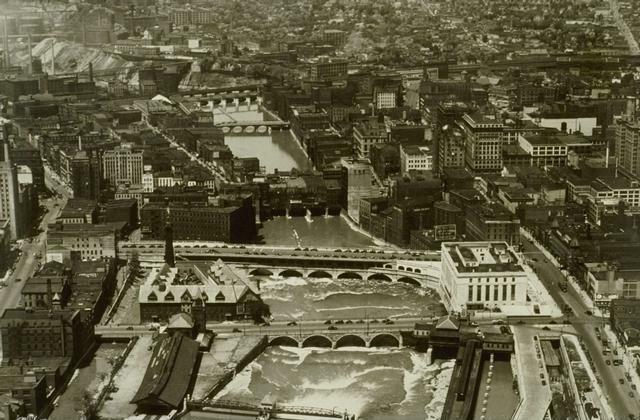 At the beginning of the 20th century, Rochester was home to 162,800 people, and was the 24th largest city in the U.S. By mid-century, the city had reached its peak population of 332,488. At the end of the century, the city population had receded to 219,773. By 2000, the region, which was entirely populated by city dwellers in 1900, had grown to a sprawl of city and suburbs totaling 1,034,090, the 51st largest in the nation. Rochester, looking northwest. Wiki image. Again, the features of Rochester’s shift from a centralized city to an auto-dominated, sprawling (and unsustainable) region are the same as most American cities born in the late 18th or early 19th century. The markers along this arc of change are well known to all of us. 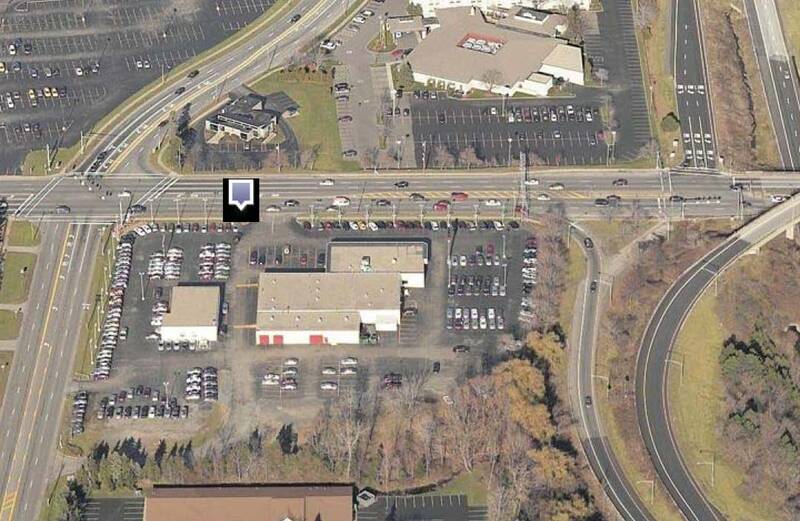 Cars, suburbs, shifting places of employment, strip shopping and big malls, more cars, waning transit, complaints about congestion, expressways, more cars, empty downtowns with literally half the land used as parking lots, increasing strains on city coffers as the wealth, and population, of the region motors into the countryside. Carol Stream, Illinois. Photo by Alex MacLean. But now let’s take a peek at this particular city, and its particular circumstances. 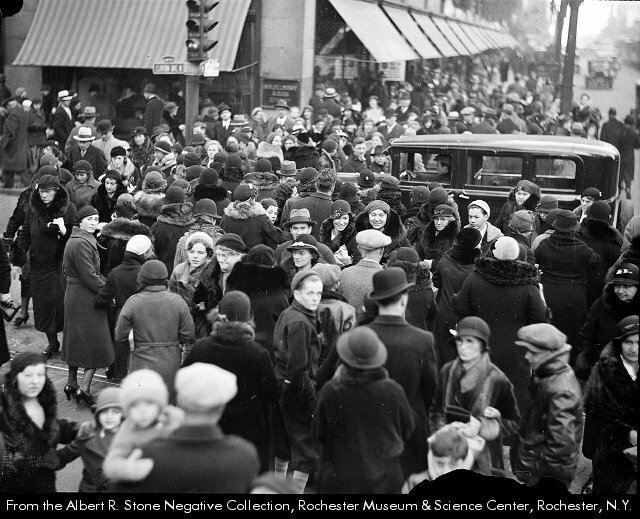 During the 20th century, Rochester was a place of wealth far greater than its size would suggest. Kodak, Western Union, Bausch and Lomb, and in 1906, Xerox, were enormously successful in the early years of the century, and this wealth allowed for the construction of substantial social infrastructure. 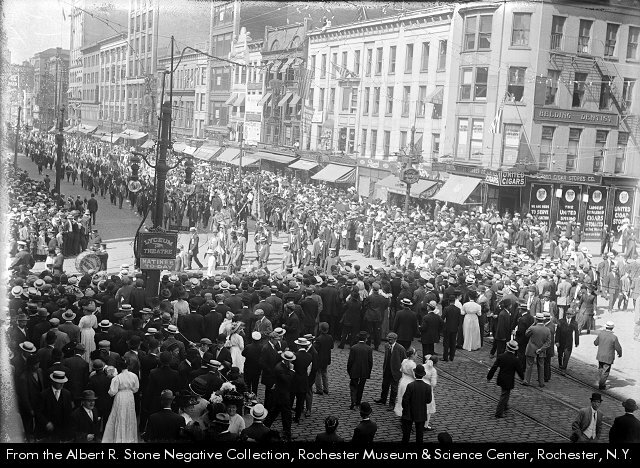 Today, we Rochesterians enjoy culture well beyond our census data – a great orchestra, and the Eastman School of Music, (30 cultural institutions started by George Eastman largesse alone), great museums of a wide array, great universities, a great jazz festival, and a summer ‘art’ fair that draws more people than the city’s population. There is much to see and do, and experience, for a city this size. 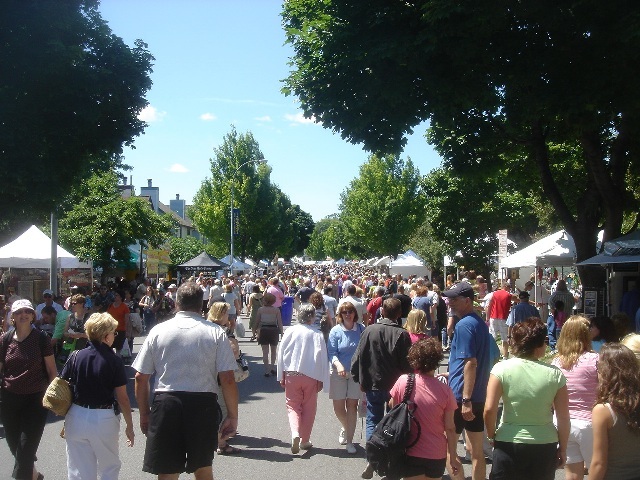 Throngs at the Corn Hill Arts Festival. And the city’s population, and now the region’s, is and has been characterized by a very high level of technical skill and scientific and technical education. 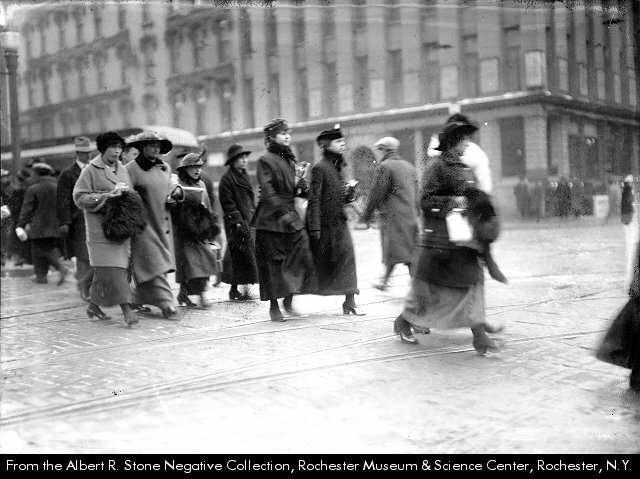 Beginning in the 19th century, Rochester was home to companies and institutions that needed, and attracted, a gifted workforce. In fact, that’s one reason why we’re here. Amy’s parents came here in the early 1930s, and her father joined Kodak. He was a physical chemist, worked on the Manhattan Project during WWII, and then returned to Kodak. When her parents moved to upstate New York from Pittsburgh, they lived at first in the city. But by the mid 1930s they had moved to the northern suburb of Irondequoit. So it goes. 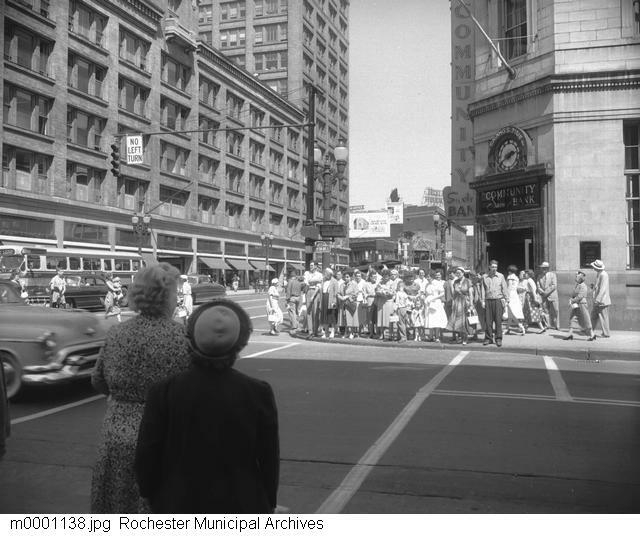 This moment then, the mid 30s, was the top of Rochester’s arc of change – the city population took a dip in the 30s as folks spread out, presaging what was to come. Then, with WWII, the population stabilized and grew a bit due to the war effort, before the inevitable exodus began again, now in earnest, by the 1950s. 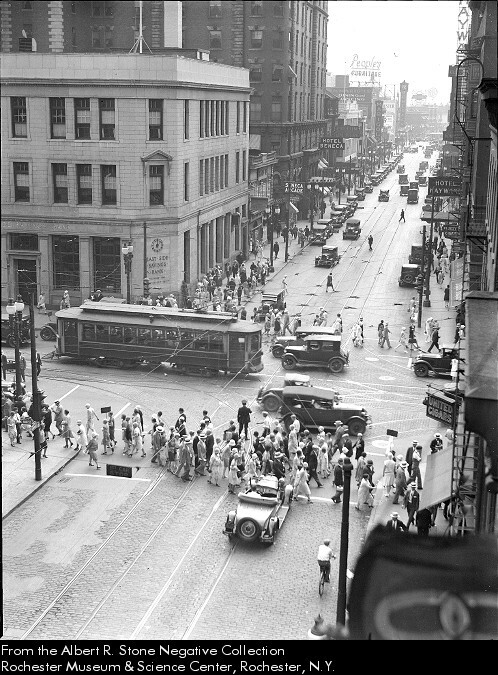 So in the late 30s, there was already a lot of hubbub about traffic and congestion. 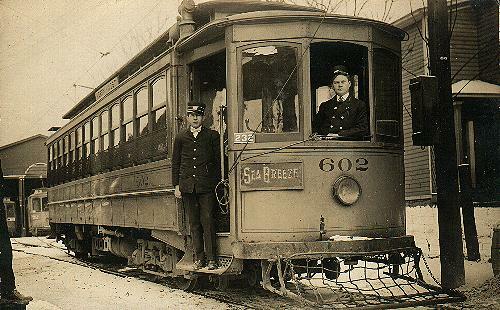 Even though Rochester had a subway beginning in the late 20s, and streetcars until 1941, (pretty early for a streetcar system collapse – they ran in my hometown near Chicago until the mid-1950s), automobiles were king at a pretty early moment. The Sea Breeze Trolley – gone but not forgotten. 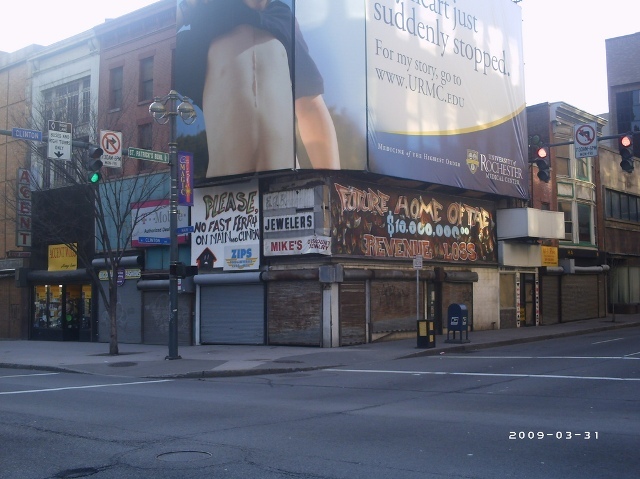 Thus comes the most single most destructive moment in the city’s 20th century urban history – one that set a precedent for all kinds of other really dreadful urban missteps. Not the only big mistake mind you, but the worst. The Inner Loop. 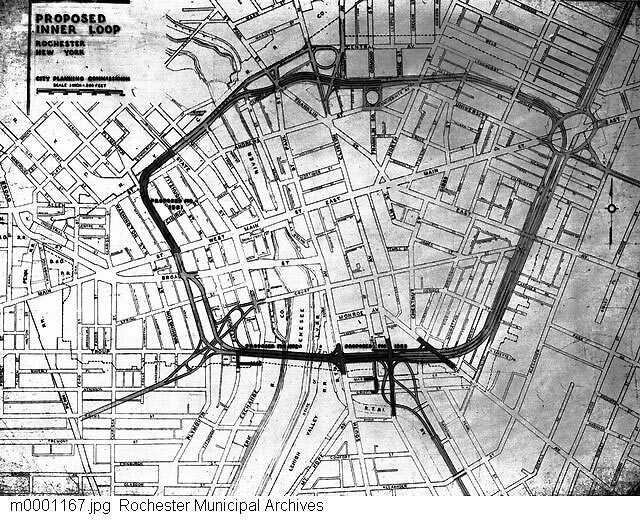 Conceived as a way to alleviate increasing downtown congestion as the city’s population neared its peak, the Inner Loop was born as an idea in the late 30s and early 40s. Engineering began in earnest in the late 40s, and the Loop was under construction by the early 50s. Huge swaths of urban clearing were undertaken to make way for the moatlike expressway – a kind of prelude to the massive urban renewal of the later 50s so common throughout the U.S. 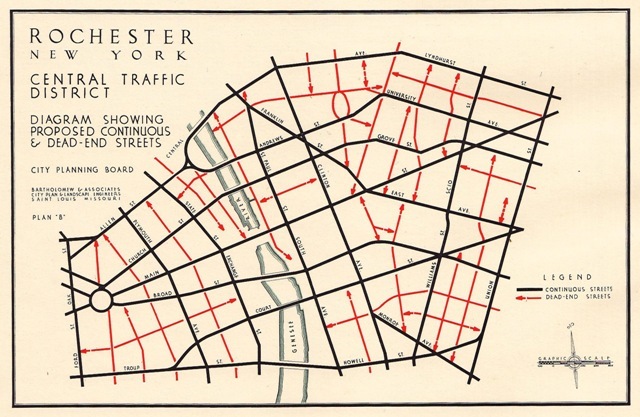 The 1951 Inner Loop plan. Hundreds of buildings were demolished, and a kind of Maginot Line was created between the fabric of the city and its downtown. And this was only the first of these efforts. Later expressways followed, making it easier and easier to avoid the central city. And of course as it got easier to live away, it got easier to shop away from downtown, and to live all of the rest of one’s life without ever seeing the city itself. So where does all this leave us? Rochester is a shrinking city with a great history, great richness of culture and social infrastructure, great assets in its population and their impressive capabilities, a lovely city with wonderful tree-lined streets and historic architecture. The surrounding countryside is enormously attractive, the Lake is at hand, the universities are very strong (University of Rochester has now supplanted Kodak as the region’s largest employer). It’s a pretty terrific place. But it is not sustainable, in any sense. 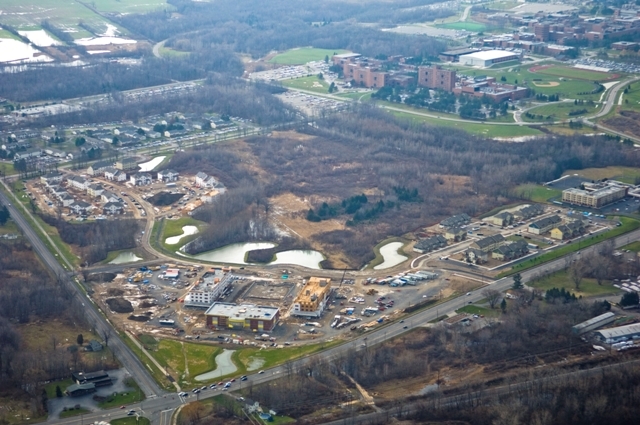 Sprawl in Greece, NY, a suburb of Rochester. What do I mean? Well, perhaps the simplest way to understand the challenges ahead is by doing a little simple math. 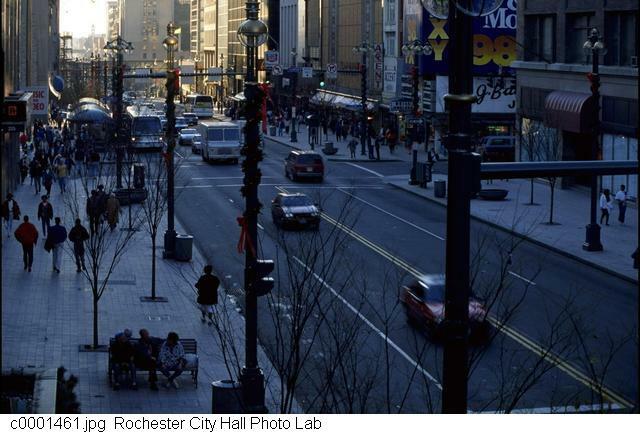 The Rochester Metropolitan Statistical Area (MSA) comprises five counties: Livingston, Monroe (where the city resides), Ontario, Orleans and Wayne. The regional population in a 2007 estimate was set at 1,030,495. The land area of the MSA is 4,869 square miles, or 3,116,160 acres. 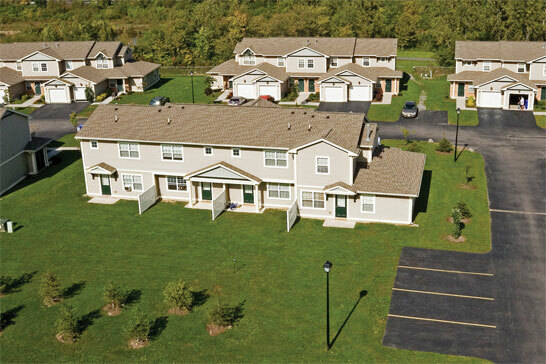 All of which leaves us with a mess of sprawl – 1 person for every 3 acres. Does the MSA include farmland and parks and other open space? Of course it does, like any other MSA in the nation. But spreading out like we have means many features of now 21st century life can’t continue much longer. Spreading out on Ridge Road, Rochester. Here’s just one reason, without resorting to any environmental mumbo-jumbo: money. 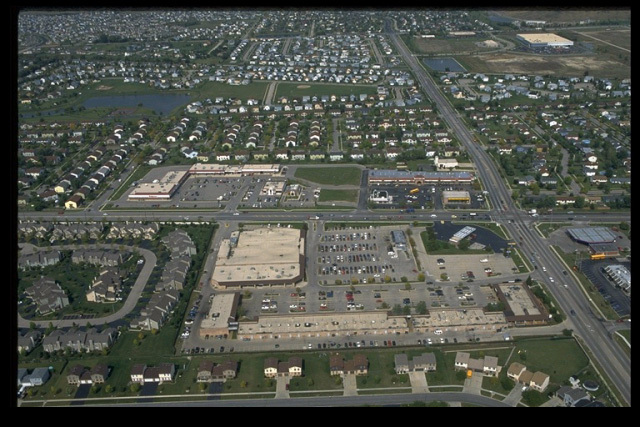 If the region has just over 1,000,000 souls, and has had to build all of the physical and social infrastructure necessary to allow this level of sprawl, there is a limit that we can reasonably expect in taxes extracted versus cash required to pay for the mess. And we are reaching that limit. Every day we read about the fact that there are not enough dollars to pay for schools, repair bridges, keep the libraries open, provide adequate fire service – it’s pretty much an endless list. (It doesn’t help that New York as a state is in major financial trouble as well, and for many of the same reasons). Property taxes here are some of the highest in the nation, while real estate values languish. So without resorting to facts like global warming, or water scarcity, or an industrialized food system that is eating us alive, or a lack of sustainable energy, or any other of the problems that are closing in on all of us at a breakneck pace, we can talk about the sustainability and survivability of a city, and a region, from a strictly economic perspective. We can’t go on much longer as we have been – we simply cannot afford it. Or we could talk about governance as another example of why a region like ours will have to make some fairly radical changes in order to carry on. This part of the nation is a county-strong place – county governments have a lot of power here. The county and the city are wrangling all the time for control of all sorts of stuff – the big one at the moment is schools. But with five counties in the region, a major city, and hundreds of towns, villages, school districts, park districts – you name it – we are constantly tripping over boundaries, and local sets of interest. With all of these separate units of government, there is endless bickering over power, endless NIMBYism, endless attempts to protect one fiefdom or another. So while our fates are inevitably lashed together, our system of governance is perfectly designed to prevent us from working together on our really big challenges. Maybe this is the tiny patch of ground we need on which to start building the next city.